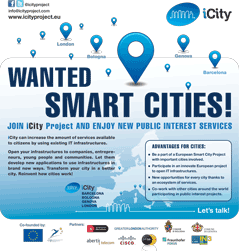 It has been four years since the iCity Project started; in 2012 three European cities, Barcelona, Bologna and Genova decided to work together on a very ambitious project that had to change the way Apps are created and presented the proposal to the European Commission. The main idea was to create a platform that would allow developers to create Apps capable to run in every European city as long as they open their Information Systems to the platform. This innovative system means a great safe of resources for European administrations and, for many small cities that have no budget for developing Apps, is the only chance they have to offer quality services to their citizens, the only chance to become smart cities. Today the commitment of these cities to the European Commission has ended and the Final Review that took place in Barcelona in 16th November was a great success. The results presented during the review and the opportunities that the project still means for Europe convinced the jury of the iCity Project’s well doing. The project received positive assessment from the project offices and reviewers. During this quest the cities have not been by their own. The Consortium of the project counted on Abertis, Cisco, Citilab, Fraunhofer and UOC’s help and commitment. They developed the iCity Platform, defined an engagement methodology, Apps and created an ecosystem of stakeholders. Also the participation of external cities, private companies and developers have helped the project growing and proven the iCity Platform very useful in the App’s creation process. Altogether it is the materialization of those goals established four years ago. Despite of the fact that the iCity Project was carefully thought and planned, the reality has changed during its development and it was forced to adapt. Besides, unexpected uses of the platform appeared. For example, the creation of the ParkFinder’s App in collaboration with SEAT. The demo of the app using the data provided by the Barcelona Parking sensors network implemented in Les Corts neighbourhood broke the barriers in which concerns the Smart parking proof of concept and the viability of the platform. Now it is time for the iCity Project to continue on its own and that is why Consortium partners gathered in order to discuss a business model that would allow the project to grow and offer the services the society requires. In this sense, the Cellnex decision of maintaining the platform until the end of December 2016 for engagements purposes has been fundamental.